Let yourself be taken over by the light of Christ, and spread that light wherever you are. At St. Jerome Parish School, our students shine! Once you enter through our doors, it is clearly evident that Christ is present in our school. Our students shine the love of Christ to others daily through their words and actions. It is not unusual to walk through our hallways and see one of our middle school students helping our Early Childhood Littles. St. Jerome Parish School offers each child a Catholic value-based education, providing a loving and caring environment in which to learn. Our educational philosophy is based upon educating the whole child and embracing the uniqueness of each child created by our loving God. Jesus is certainly our formational role model for how we live and interact with others. This upcoming school year, we will focus on the Virtue of Charity as we journey through the year using the Virtues in Practice Program by the Dominican Sisters of St. Cecilia Congregation of Nashville, Tennessee. As we progress through the year, we will study the saints, focusing school-wide efforts on the lives and words of St. Pope John Paul II and St. Teresa of Calcutta. Pray for us as we study and learn all about the Virtue of Charity! At SJPS we believe that parents are the primary educators of their children and respect their role by journeying with them through the year, providing our students a solid foundation so that they may grow into responsible young adults who can make a positive difference in our world today. It would be my joy to meet you and your family and share our faith-filled program with you. Please contact our School Office, 262-569-3030, to arrange a date and time to become acquainted with our school and the rich Catholic value-based formation we offer. Come and see what a difference a Catholic Education can make in the lives of your family! 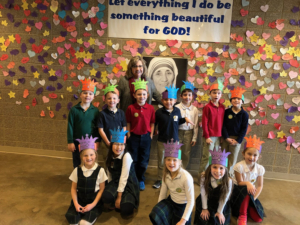 St. Jerome Parish School offers a Catholic Elementary Education to the children of the greater Oconomowoc community in an environment that fosters service and lifelong Catholic values. We are committed to providing a strong educational foundation challenging children under the professional guidance of a dedicated, enthusiastic staff in partnership with parents. St. Jerome Parish School is committed to providing our students with a solid Catholic foundation which is a stepping stone for successful achievement throughout their high school years and beyond. As our graduates depart for their respective high schools, it is our vision that each be equipped with the following: a strong moral compass to know right from wrong; the “light of their faith” to grow brighter throughout their high school years; their love for learning to always be the motivating “star” to “reach for excellence” in their academic, moral, and spiritual life. Grounded in these attributes each child will make a difference in their surroundings and future schooling. Our mission statement is visible through wall plaques, bookmarks, wristbands, signs and is made meaningful to our students, encouraging them to follow Jesus in our thoughts, words, and actions everyday. Read more about the values-based education offered through Archdiocese of Milwaukee Schools.